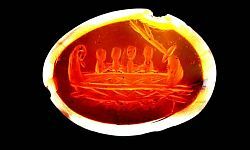 In 1996, a Roman intaglio was found washed up on the Thames foreshore with an image of a warship. It is made from a yellowish cornelian, has a convex face and is in almost perfect condition. It obviously fell out of the original setting and into the river bed where it eroded out sometime in the 1990’s. 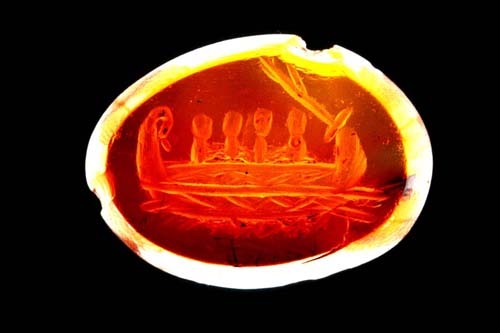 The warship displayed on the intaglio is a rowing galley, with a figurehead of a goose or swan. The lattice along the side of the vessel depicts the parados or side gangway balustrude that protected the mariners; the rudder is at an angle and below the water line and the water is shown by the horizontal line halfway down the ship and through the hatchings beneath it.